Fall wedding arrangements make great decorations for an autumn wedding. Regardless of the wedding theme you choose, floral arrangements will probably play a big role in your wedding day decorations. Flower arrangements can come in many different shapes and sizes, and they can be used in all aspects of your wedding from your ceremony to your centerpieces and other reception decorations. Fall offers some great flower choices for your arrangements. Fall wedding flower options include sunflowers, chrysanthemum (mums) and rose. If you are having an outdoor wedding you can also consider garden wedding flowers. 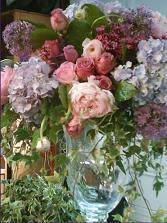 Work with a good florist to come up with beautiful flower combinations that are in season in your area. Choose vibrant fall flowers that match the natural foliage. Using fall leaves in rich red, yellow and brown tones help create beautiful centerpieces. For your ceremony you can have arrangements placed on the altar if you are getting married in a church. If you are getting married in a tent outdoors or other reception space, you can have fall wedding arrangements surrounding you as you say your vows. Small arrangements of flowers can also be attached to the first chair of each row of the aisle, or you can have larger potted arrangements line the aisle. Centerpieces are where you can have some fun, and there are many options that you can choose from. Arrangements of fall wedding flowers work very well by themselves or combined with other seasonal items. Combinations including colorful hydrangea, rose and sunflowers make vibrant centerpieces. You can also include fall accent items like pumpkins and colorful fall leaves. Don't be afraid to get a little creative. Try using unique containers, like hollowed out pumpkins or unique vases to hold your flowers. Fruit, like apples and pears, can also be used in your centerpieces. Candles also make great accent items for your centerpieces. Not only do they look good, they help to set the mood of your reception. In addition to centerpieces, arrangements can be used in other aspects of your wedding reception. For an outdoor event, hang baskets of fall flowers around the edges of your tent. You can also place large, potted arrangements around the dance floor and other areas that might need a little color. Smaller arrangements can be placed on the bar, place card table, cake table and any area that needs a splash of color.